Fighting Noise Films/Brothers Young Pictures - 70 min. Cast: Dustin Clare, Camille Keenan, Jacob Tomuri, Steve Wrigley. Principal Crew: Screenplay: Dustin Clare, Camille Keenan, Michelle Joy Lloyd; Director of Photography: Ryan Alexander Lloyd; Editor: Krisztain Majdik; Original Music: Simon Hughes; Makeup Designer: Carmen Te Moananui; Sound Design: David Raines; Producers: Dustin Clare, Michelle Joy Lloyd; Director: Michelle Joy Lloyd. Eve and Charlie are about to have a baby but they are no longer together. After years of history and months of separation they have 24 hours to find their way forward. 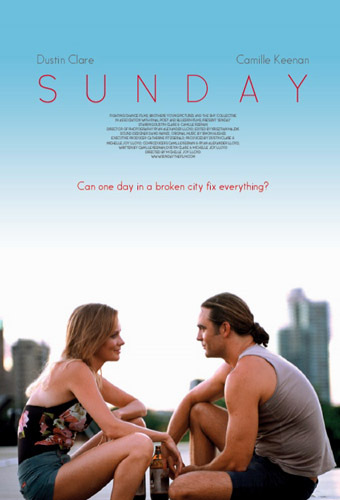 Set in Christchurch, New Zealand one year after the earthquakes that devastated the city, 'Sunday' is a story like the city, one of past devastation and a chance at rebuilding. It would seem that I see a different movie from most others. Yes, given the very low budget, one should not expect the same result as from a multi-million dollar production, but I felt that this fell short on a number of basics, such as lighting, editing, acting and direction. Additionally, I really disliked the Charlie character and the idea that Eve may still be around for him whenever he returns, makes her a fool. Eve could learn some things from the Leeanne character in the 2004 film 'Fracture'. This film is a disappointment. Starting 07 December 2014, an NTSC or PAL R0 dvd can be purchased from the producers for about $25nz, including worldwide shipping. It is presented in its original 2.35:1 format with a DD 2.1 English language track. There are no chapters, subtitles or extras. As of 16 December, 2014, I do not have any dvd release dates for any territories other than New Zealand. NTSC R0 DVD $25 includes worldwide shipping. PAL R0 DVD $25 includes worldwide shipping.